Is It Worth It To Buy A Serger? The overlocking machine began back in 1881 with the creation of the first machine for crochet stitching and evolved into an overlock machine now commonly referred to as a serger. There are basically two types of overlock machines, those for industrial sewing and those for the home sewer. Industrial machines have one type of stitch and can sew up to 9500 stitches per minute. Machines for the home sewer have multiple stitch variations and can sew about 800-1700 stitches per minute. Although overlocking machines are much faster than regular sewing machines, they cannot replace the sewing machine, but are a companion to sewing machines. bobbins. Instead these machines have what are called loopers. What are loopers? Loopers are those parts of the machine that work with the needles to lock the threads together and link up with the needle or needles to form stitches. Overlocking machines are also unique compared to sewing machines because they can perform three functions at once. Overlocks can in one step sew, cut, and overlock a seam. What does an overlocking machine look like? Here is one example. They all have the same basic design, the differences being the number of threads and whether the machine is a computerized model or not. If you want that professional looking finished seam, then an overlock is the machine of choice. These machines can also finish edges, sew stretch seams, embellish, reduce puckering, create rolled hems, perform regular hemming, gather and reduce the time that it takes to construct a garment. 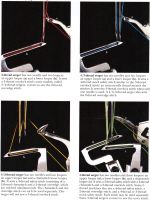 The above images are courtesy of the Singer Sewing Reference Library of books, The New Sewing with a Serger. Another excellent book on the subject is Gail Brown's, Sewing With Sergers: The Complete Handbook for Overlock Sewing. These different thread and needle combinations are designed for different types of fabrics as reinforcement to a particular type of fabric or seam. 1. How should the machine be taken care of? Click here for some information on machine care and maintenance basics 2. How do we troubleshoot for problems when something goes wrong with the overlocker? Click here for some troubleshooting basics 3. How do we know when a professional should look at our machine? Click here for some repair basics There are some excellent articles on the serger at sewing.org under their sewing Guidelines. There are also some nice introductory videos online that discuss these overlock machines. These are difficult machines for many to understand, so a visual of the basics and operations is a definite plus, for a nice video series, click here on the link to eHow.com Although many machines today have an overlock capability, the variety of thread and needle combinations provided by overlock machines make them a worthwhile investment that can enhance the sewing machine. The overlock machine and sewing machine together create a great sewing partnership.